About six years ago I was blessed with a dog that seemed to be sent to me. My seven year old whippet was killed by a car. I could not take the loss and came to whippet rescue sites. Discouraged that there were no adoptions and none near me, I asked about the breeder of my dog. He didn't know but the next morning he told that he had to find a home for my dog's litter mate Leo. Six years ago Leo and I bonded. It seemed like a second chance with his brother born the same day. It has been too good to be true since. He became so devoted to me and paced the floor when I left. My wife felt she didn't matter being with him when I left. He was so tuned in to everything I did, 24 hrs a day. The truck, boat, and kayak he loved it all. If I got up he did too from room to room. I said he would wait at my grave for me. He was so well behaved I never needed a leash or fenced yard. He would stop a chase with a no. 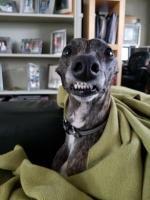 Whippets don't do that. He is my fifth whippet but none are alike. None will be like him but you consider yourself lucky or blessed like I was if you find one. We lost the battle for Leo yesterday at 13 years old. We had two horrible days in the 13 years with these two dogs. The rest were wonderful. Don't know how to start over. Almost 40 years with them. We lost my 11 year old whippet recently to cancer. She was a rescue from WRAP, and my devoted shadow for 9 years. also a couch potato like your photo of Leo. Miss her every day. They are a joy. Join in and write your own page! It's easy to do. How? 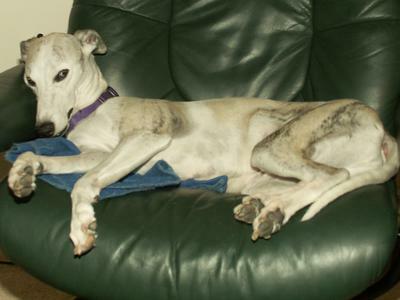 Simply click here to return to Whippet Dog Stories.